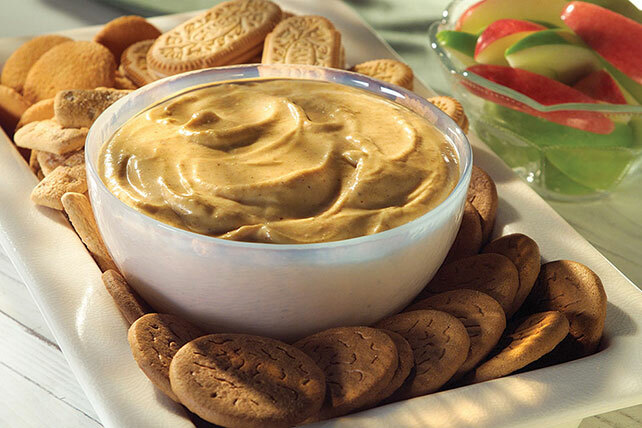 Enjoy this creamy, delicious PHILADELPHIA Pumpkin Dessert Dip. Made with cream cheese, marshmallow creme and pumpkin, this PHILADELPHIA Pumpkin Dessert Dip is a perfect complement to gingersnap and graham cracker dippers. Mix all ingredients until well blended; cover. Serve with cut-up assorted fresh fruit and cookies. Savor every bite of this sweet dip. Each 2-Tbsp. serving goes a long way on pumpkin flavor. Makes 2-1/2 cups or 20 servings, 2 Tbsp. each.